Praised for her “thrilling, inspirational performance” (Florida Sun-Sentinel) and “elegance of line, leaping energy” (San Jose Mercury News), pianist Yukiko Sekino has forged a career that encompasses a wide range of interests. A soloist noted for her performances of Beethoven, Rachmaninoff, and Scriabin, she frequently collaborates in chamber music and performs some of the most challenging twentieth and twenty-first century works. Sekino is the Gold Medalist of the 2006 International Russian Music Piano Competition and a 2010 winner of the S&R Foundation’s Washington Award. During the final round of the International Russian Music Piano Competition, she received the Public Prize through audience vote for her performance of Rachmaninoff’s Third Piano Concerto. Sekino is also a winner of Tanglewood Music Center’s Jackson Prize, the JAA Music Award in New York, and the Mu Phi Epsilon International Music Competition. She made a debut with the Boston Symphony Orchestra at age sixteen, and has since performed with the New World Symphony, Harvard-Radcliffe Orchestra, and Stony Brook Symphony Orchestra. 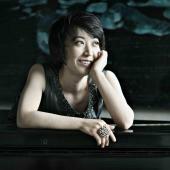 Recent recitals include the Overtures Series in Washington, D.C., Dame Myra Hess Concerts in Chicago, Tri-County Concerts in Philadelphia, Northeast Asia International Piano Festival in China, and U.S. college campuses such as Eastman School of Music, MIT, Ithaca College, and East Carolina University. She has given masterclasses in the United States and China. An avid chamber musican and a new music performer, Sekino has been invited to Tanglewood Music Center, Thy Masterclass Chamber Music Festival (Denmark), and Kneisel Hall Chamber Music Festival. Between 2005 and 2008, she was a resident pianist of the New World Symphony under the direction of Michael Tilson Thomas. In 2013, she performed as a soloist in Elliott Carter’s Double Concerto for Piano and Harpsichord in Zankel Hall at Carnegie Hall as a culmination of the Weill Institute Professional Training Workshop with John Adams and David Robertson. Sekino is a graduate of Harvard University and the Juilliard School, and holds a doctoral degree from State University of New York at Stony Brook. Her teachers include Gilbert Kalish, Seymour Lipkin, Robert Levin, and Eda Shlyam. She previously taught at Colby College, and currently teaches piano at Massachusetts Institute of Technology and the New England Conservatory Prep School.